My study area for a TUFLOW 2D simulation is given below. 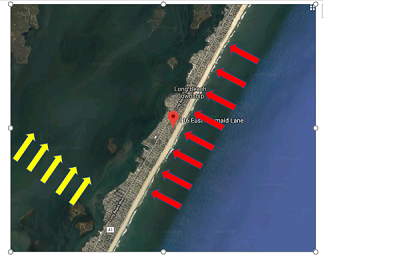 The red arrows indicates ocean and yellow arrows are for river. I have water level vs time data for both of the side. For the river I can easily draw a BC to represent the flow. But how should I model the BC at the ocean side. Should I draw a big arc acorss the ocean side to represent the BC? Tidal or ocean boundaries are usually represented by an HT boundary that spans along the ocean for the width of the model. The boundary should extend up to an elevation at least equal to the boundary water level.